by Homer Ashurian - History & Cultural Director, Assyrian Universal Alliance. March, 1999. Roomrama is one of two de facto national anthems of the Assyrian people. Salma d'Shoobakhan is one of two de facto national anthems of the Assyrian people. 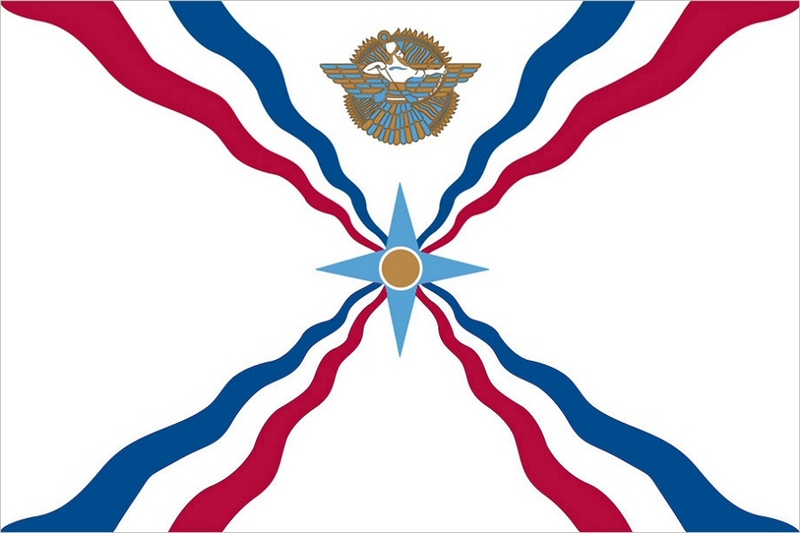 In the aftermath of the inception of the Assyrian Universal Alliance in 1968, a serious effort was undertaken by this organization to address the need for the Assyrian nation to have its own official national flag. To realize this dream it was decided to appeal to various Assyrian artists and knowledgeable people, for the purpose of soliciting ideas and layouts on this important national task. Layouts and suggestions were to be collected from across the world in order to be presented to the AUA Congress for approval. This worldwide effort netted a large number of designs which were duly received and noted. Following meticulous consideration, a decision was reached in favor of one particular design which best captured the Assyrian essence from the past and the present. In the year 1974, this design was approved by the 6th congress of the AUA which convened in the United States in the city of Yonkers, New York. This flag was designed by a well-known Assyrian artist, Mr. George Bit Atanus of Tehran, Iran. The main reason for the approval of this flag was that the artist had not merely presented his own views. Rather, he had brilliantly blended ancient Asian designs representing the former glory of the Assyrian empire, to create an attractive fusion between the past and the present. In this way the artist had succeeded to bridge the gap between a glorious Assyrian past and the present day struggles and ambitions of the Assyrian nation. The Assyrian flag is designed with a white background on which three waving stripes emerge from each corner of a center design which is in the shape of a four headed star. At its center, the star encompasses a golden circle representing Shamash the Assyrian sun-god who was believed to give life to all things on earth. The four wedges of the star are a bright blue color and represent happiness and tranquility. The waving stripes protrude from the four joints of the star and stretch to the four concerns of the flag. The Stripes are narrow at the base and become wider as they distance themselves from the center. They symbolize the three major rivers flowing through the land of Assyria. At the top we see the mighty Euphrates, represented in blue denoting abundance. In the center the great Zab is in white portraying peace, and in the bottom we see the mighty Tigris in a red color representing the Assyrian national pride. These three stripes are also picturing the rays of the center star and stand to symbolize the dispersion of the Assyrian people to the four corners of the world. The manner in which these stripes emerge from the star also symbolically portrays the eventual return of the Assyrians to their ancestral homeland which is represented by the center of the star. Hovering over the star and the emblem of Shamash, there is a representation of the image of God Ashur the ancient Assyrian supreme deity. The emblem of Ashur features the deity standing in a circle with two eagle wings spanning and over stretching its length on two sides. Ashur has drawn a bow and his arrow is ready to fly. This emblem is in the same shape and color scheme of the original ceramic work preserved in the British Museum. Finally, atop the flag there stands the royal insignia of the famous Assyrian king Sargon II, signifying the might and great civilization achieved by the Assyrians.